Confined Space Training and Rescue Classes taught on site. Hands on training in confined spaces and rescue. Learn how to work in a confined space environment to maximize safety for you and those around you with invaluable hands-on practice of rescue and operations. Our training course is designed to protect workers entering, or working around, a confined space. We explain safety regulations for the personnel working in permit, non-permit required confined spaces, and educate each worker about the hazards that may occur during the work in confined spaces. Our training course is designed to protect workers entering, or working around, a confined space, and educates each worker about the hazards that may occur during the work in confined spaces. Identify what types of areas are considered confined spaces, including permit-required confined spaces and non-permit spaces, and to define each term. Identify common hazards in confined spaces, to include atmospheric & physical hazards. 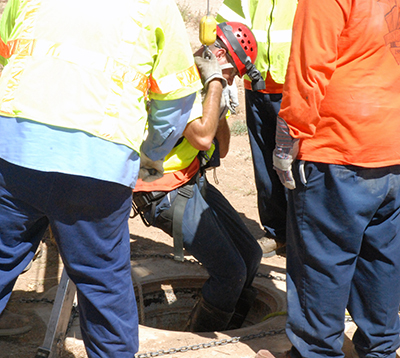 Identify the roles and responsibilities of the Entrant and Attendant (as defined by Cal/OSHA) for various personnel during confined space operations. Employees who may enter confined spaces with potential hazards are required to receive confined space safety training. Water works companies, public agencies, etc.